The Washington Post called them the “Willa Wonkas of Burgercraft” in a review, and they have been Zagat-rated for nine years. 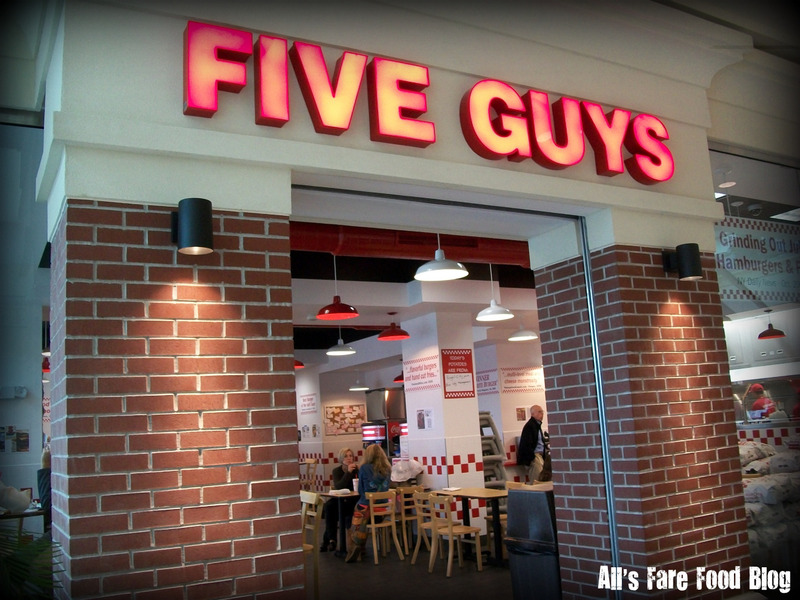 With monstrous burgers and ridiculously large portions of fries, Five Guys Burgers and Fries recently opened a new location at Mayfair Mall in Wauwatosa, Wis. The national chain now has six Milwaukee-area locations, and in 2010 is looking to open up 200 more chains across the US. The Mayfair location opened in the storefront formerly occupied by The Sharper Image and a Laacke & Joys seasonal location (for longtime Milwaukee residents you might also remember it was once home to Mr. Bulky’s candy store), across from Panera Bread on the shopping center’s first floor. The restaurant has an indoor mall entrance and an outside sidewalk entrance. The menu is simple. Burgers, fries, hot dogs and soda. All toppings including A-1, fried onions, grilled mushrooms, jalapenos and more are free. You also can get your fill of peel-and-eat peanuts. The decor is simple. Lots of white and red, stainless steel, glass windows and propaganda telling you how great the burger you are about to eat is. Seating is mostly high pub-like tables or standard tables. The line awkwardly snakes around piles of potatoes from Idaho. The mall entrance makes getting into line a bit easier. People using the exterior entrance seemed a bit confused about how to queue. Off to the side is the soda station (offering free refills on Coke products). If you have kiddos, you might like that they can color an ode to Five Guys and have it posted in the restaurant. Gotta love something to keep the little ones occupado. 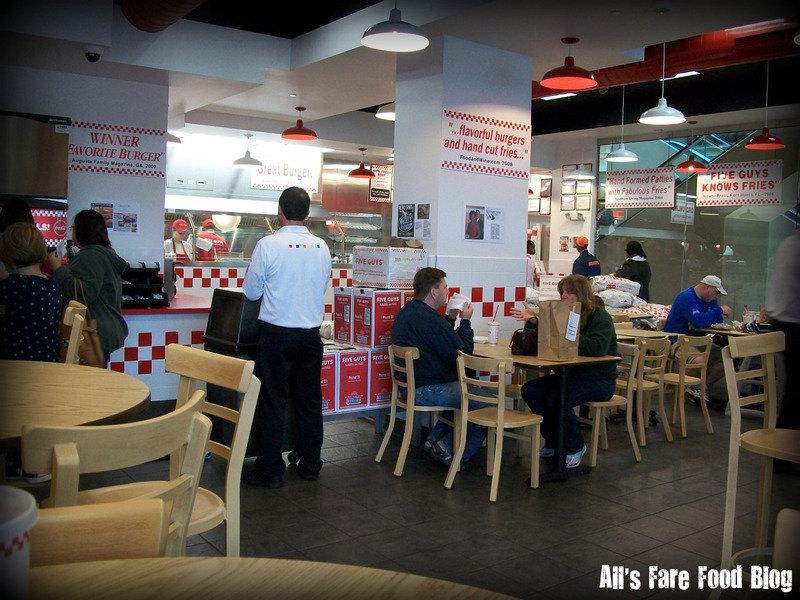 But the best feature of all Five Guys locations is the open-concept kitchen. I love that you can see your food made right in front of you. 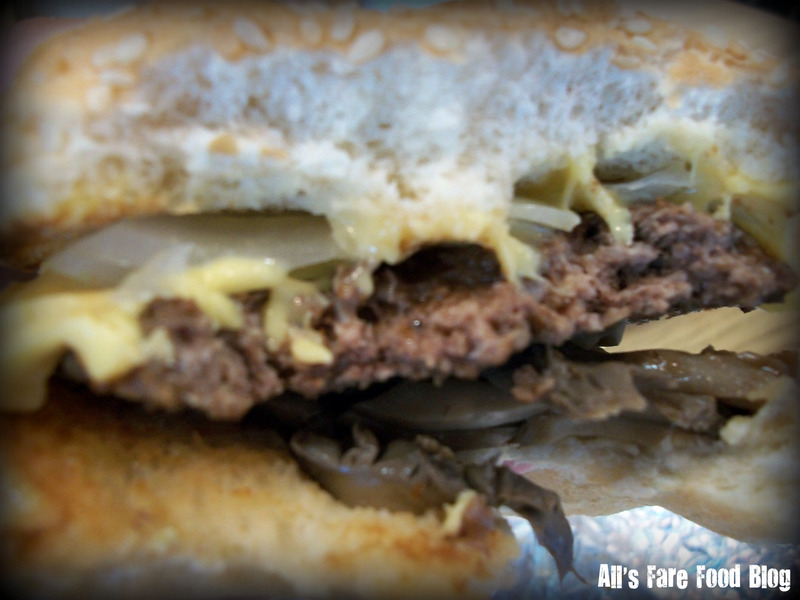 Five Guys patties are hand-formed. 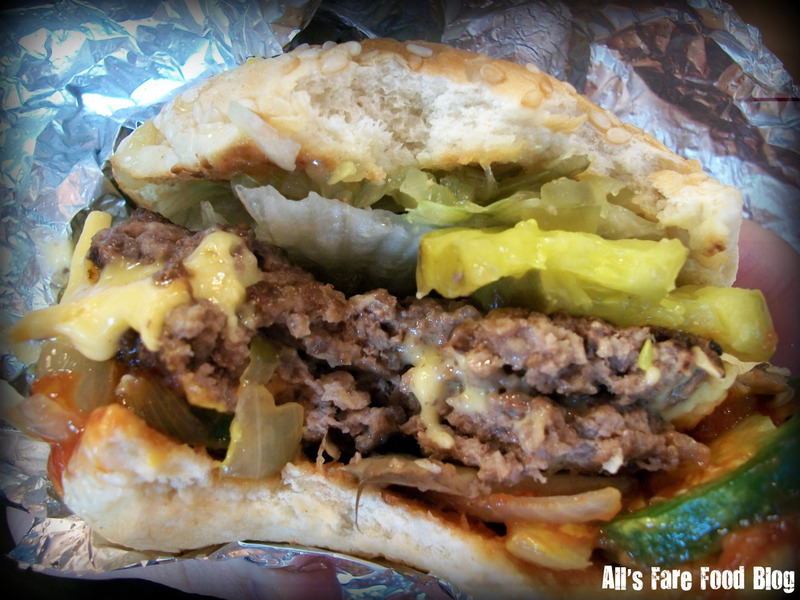 A little hint for newbies…The “regular” burger is really a double. If you can’t eat that much (it’s a lot and I like my meat), order the “little” version. And even the little is more than enough. As I said earlier, all toppings are free – so order away with whatever combo you’d like. On a recent lunch trip, my hubby ordered a cheeseburger and a messy concoction of jalapenos, mustard, lettuce, ketchup, fried onions, pickles and mushrooms. 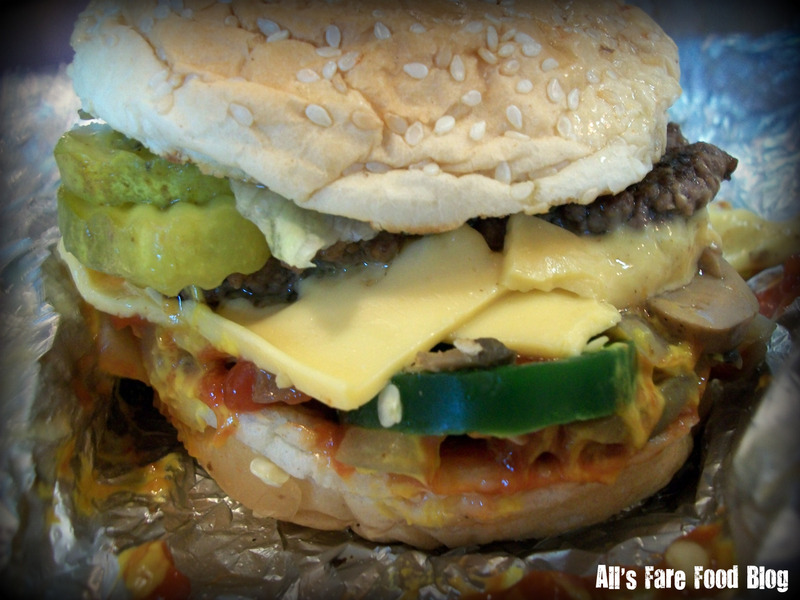 All burgers are served in minimalist aluminum foil. Just remember lots of napkins if you order like my husband. 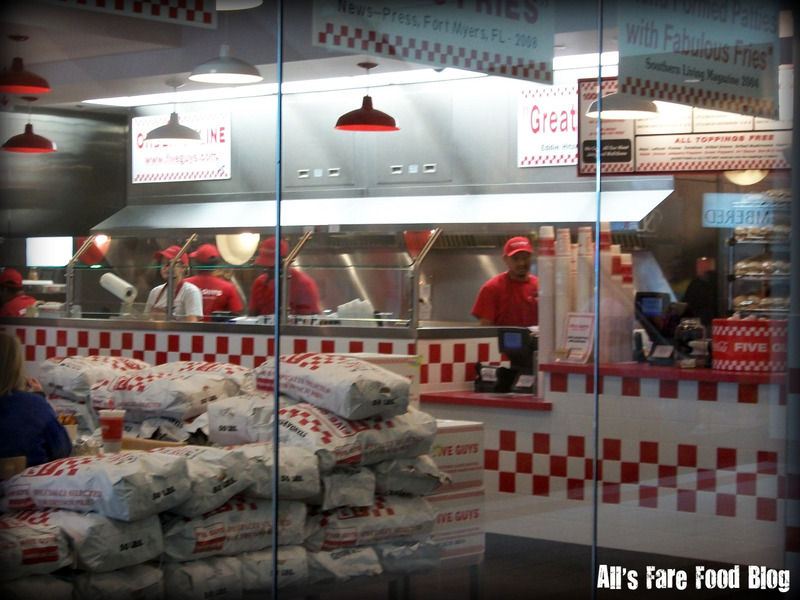 So, now that you’re hungry, start thinking of the 250,000 ways you can order a Five Guys burger. 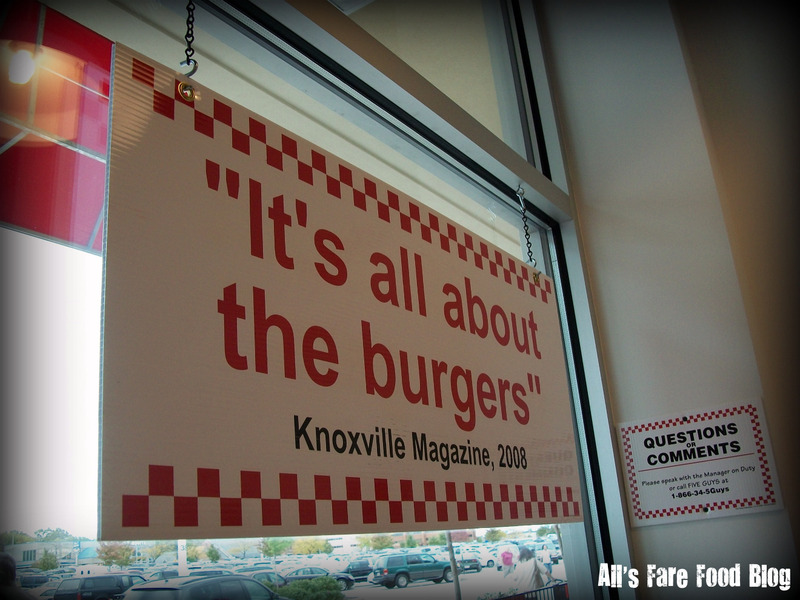 Learn more about Five Guys, check out their website and menu at www.fiveguys.com. You can even order online and purchase Five Guy’s gear. Remember tonight is the cheeseburger match-up on Travel Channel’s “Food Wars” pitting Milwaukee’s AJ Bombers against Sobleman’s. Tune in at 9 p.m. central! Check out our preview! This entry was posted in Cuisine - American, Places - Milwaukee and tagged Burgers, Five Guys, fries, ketchup, Mayfair, Milwaukee, Mr Bulky's, mushrooms, mustard, onions, peanuts, Wauwatosa, Zagat by Christina. Bookmark the permalink. I’ve been to Five Guys just once, but it was amazing. Loved the personalization of burgers and the fries. Glad there’s a location closer to me, too. I was just by UWM the other day and didn’t realize they bought some real estate on Oakland Ave. I think it was that fast-food Asian place…can’t remember the name, though. December 27, 2014 I frequent five guys periodically and have always enjoyed the fries. Today, I purchased 3 burgers and 3 fries for almost $35.00. It was pure garbage! 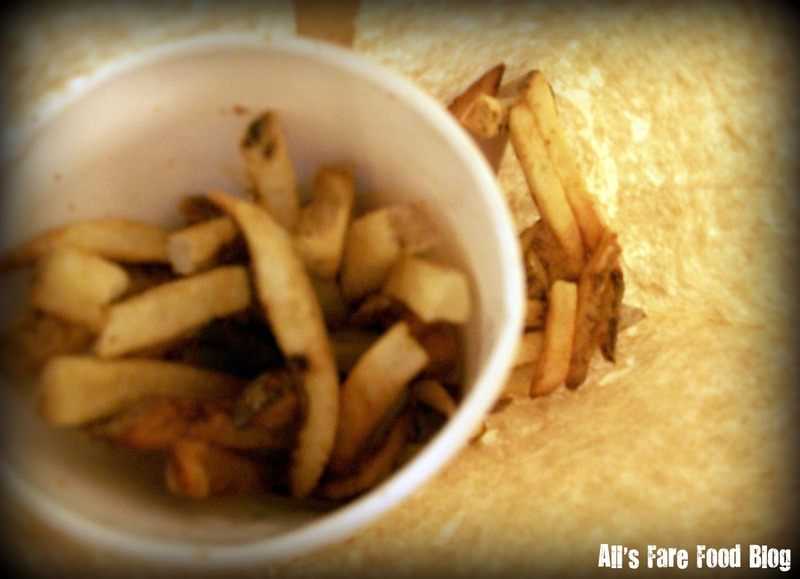 The fries were wilted, soaked in grease so much so the bag was dripping with grease. The oil had to be old and the fries were absolutely not edible. The burger was bland and even though I put salt and ketchup after 2 bites, I tossed it along with the wilted grease soaked potatoes into the garbage. The lettuce was yellow and left a rancid taste in my mouth. If not for a 30 minute drive (to and from Clifton Heights on Baltimore Pike) I would have returned the garbage. If 5 guys continues to serve this kind of garbage it will be closed by spring. I tossed $35 of my hard earned money into the garbage can. I will never go to another five guys. Ever!